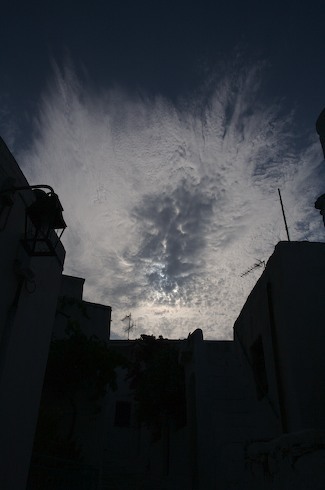 We spent five days in Paros, with the goal to relax and do not much before our final trip home. Looking back, we must have achieved this, because I don’t remember doing much! 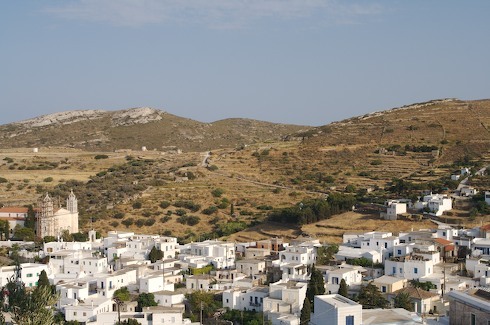 We stayed in the small village of Aliki, away from the main town, and hired a car (a tiny thing called a Fiat Punto) that got us around the island. Mostly we organised our excursions around meals. 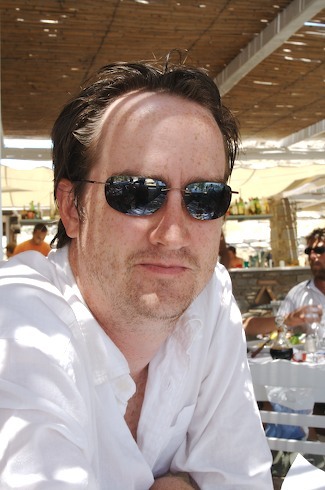 The most memorable was a great restaurant at the northern tip of the island that had expensive, but great, food and was situated overlooking a beach. Perfect for a dip pre and post lunch. 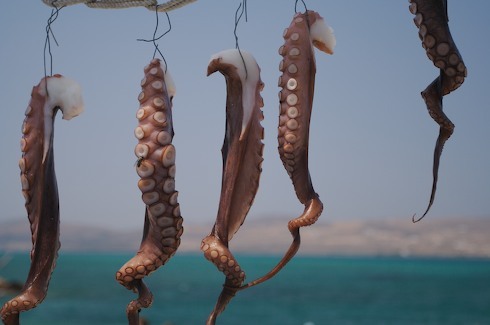 We continued our fascination of tzatziki and Greek salad and other classic dishes at many restaurants, mostly in Aliki. 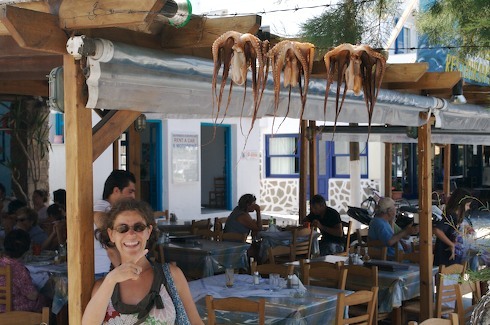 The drying squid hanging out the front of the majority of restaurants in Paros was certainly a novelty, but I don’t remember it tasting so good. 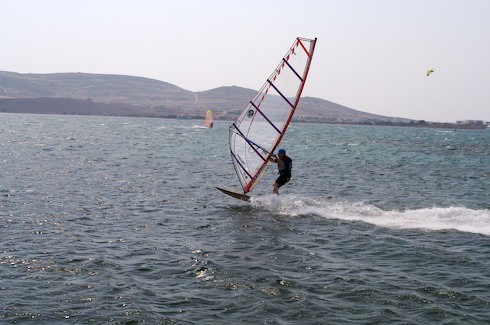 Much of the time on Paros was VERY windy, including the evening we arrived which had caused a black out (this made finding our hotel quite an adventure). 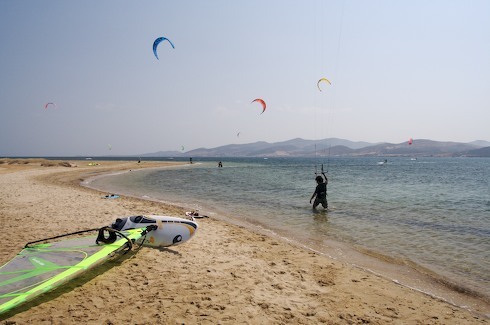 One of the perks though was the amount of wind water sports on the island, including the very impressive Kite Boarding. I was tempted to take some lessons, but thought better of it given I was pregnant… Phil booked in for some diving, but the wind decided to cancel that, and we ended up doing neither. 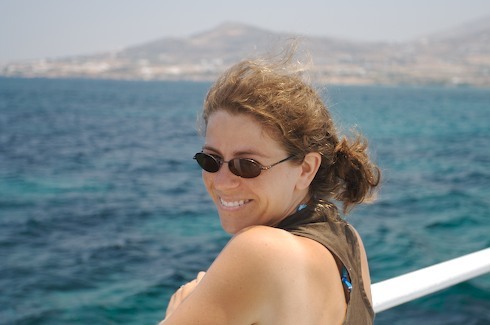 One day we took an excursion to Antiparos. 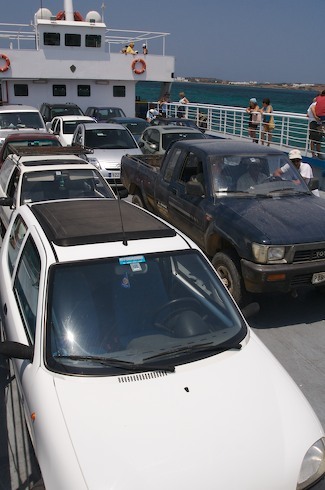 A small island just a 15-minute car ferry away. 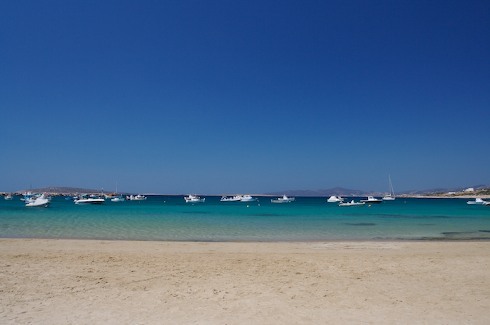 Antiparos is even slower and more desolate than Paros proper. 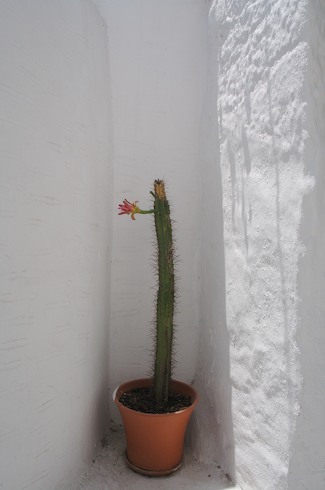 On Antiparos, there is the fantastic Cave of Antiparos. It is absolutely enormous, about 400 steps deep. 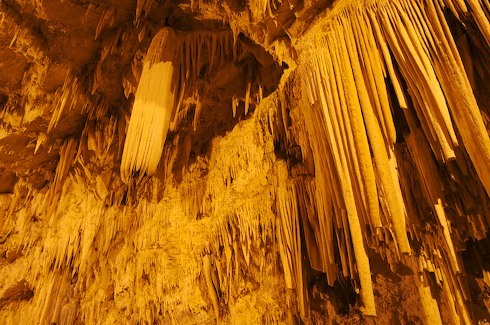 Unfortunately the tips of many of the stalagmites and stalactites have been looted over the years (mostly by Russian soldiers in the early 1700’s). 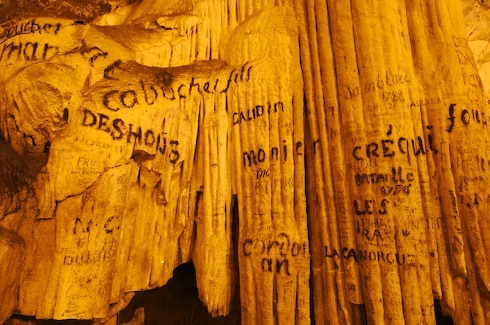 The most bizarre thing, other than the hideous lighting, is the 300 year old graffiti. Lord Byron even left his mark. Another excursion took us to Lefkes, the island’s highest village. It was very peaceful and almost empty. 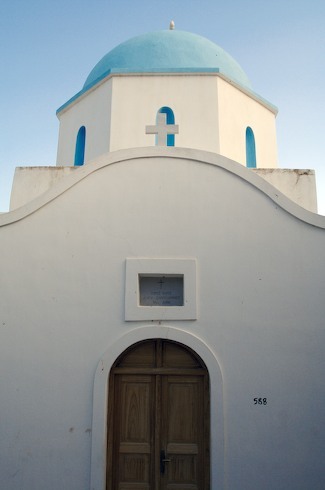 The main town on Paros is Parikia, the island’s capital and port. It was a little busy for our taste and other than renting our car and killing time waiting for the ferry (more about that in the next post), not much doing in Parikia. Once you got off the busy road along the water there were some very charming paths that wound through the village. One amusing item in Parikia was a castle that was built by Marco Sanudo, the Venitian Duke of Naxos in 1260 on the remains of a temple to Athena. 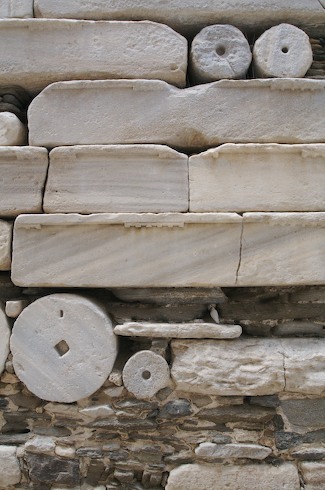 Being a great student of architecture, old Marco simply incorporated bits of the marble in ad-hoc fashion. All in all, the Greek Islands were not what I expected at all (I was thinking more Whitsundays or the Caribbean, where the islands are small, close together, encourage sailing, and are more tropical). 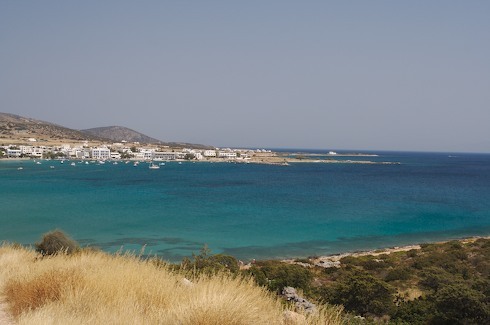 The Greek Islands are much larger, and quite a distance from each other – not island hopping material – and are very dry and arid, not lush or tropical at all. 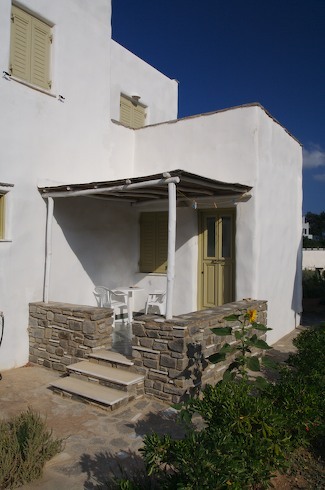 But our stay on Paros was very pleasant, and just what we needed before heading home.